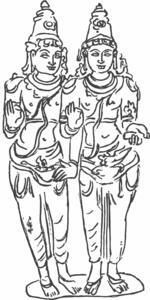 They are twin-deities that are given an important place in the Ṛgveda. At least 50 sūktas are in praise of them. They are always described and eulogized together. Being considered as the twin sons of Sūrya (the Sun-god) and his spouse Saṁjñā when they had assumed the horse-form, they have been described as ‘Aśvinau,’ or Aśvīni-kumāras (aśva = horse). It is rather difficult to say what aspect of the powers of nature they represent. That they stand for night and day, or earth and sky, or moon and sun, is the opinion of some scholars. There is also one view that they were originally two kings who were gradually elevated to godhood. They are pictured as semi-darkness before dawn. They pervade this world with moisture and light. They are eternally young and handsome. In fact, they are the youngest of gods. Their many exploits like granting youth to the old sage Cyavana, sight to the young Upamanyu who had lost his eyesight, children to Mādrī, the younger queen of Pāṇḍu are also described in the mythological literature. Tradition recognizes them as important teachers of Āyurveda, the science of health and longevity.